Orfware takes his time until 1982 when he meets a Sinclair ZX 80. Dazzled, he decides he will grow up as a coder. Even if a straight path appears in front of him, proceeding in straight lines appears unnatural – as unnatural as coding database applications for banks. Then he adopts the pinball strategy: bump violently against everything and then bounce away. He tries to combine computer programming with everything. Study. Music. Graphics. Comics. Creative writing. On the verge of a TILT in 1996 a collision occurs with a bumper labelled “video-art” and then he bounces at full speed in the tunnel of interactivity. He finds himself thrown in an unexplored area of the pinball table where he bounces furiously among museums, theaters, academies and workshops, digital video, videogames, CAD-CAM, industrial electronics. In all this mess, one only solid idea: you must maintain your kinetic energy. 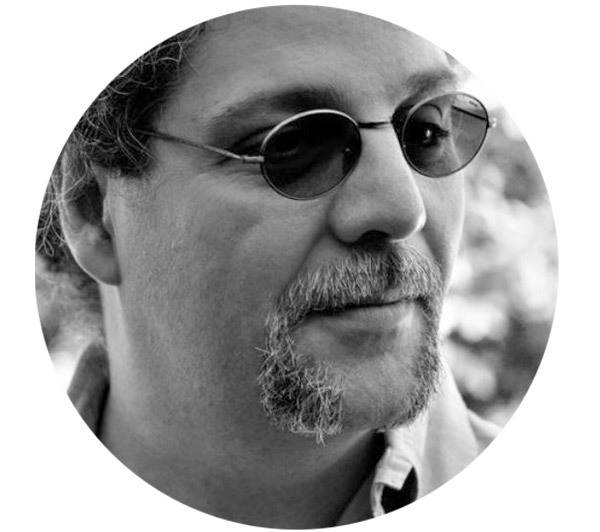 He has collaborated with Studio Azzurro, Studio N03, AiEP, Studio Vertov, Yae, LimiteAZero and NABA. 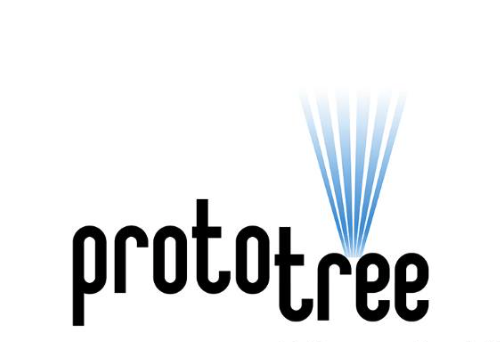 protoTree is an evolution of the same concept. 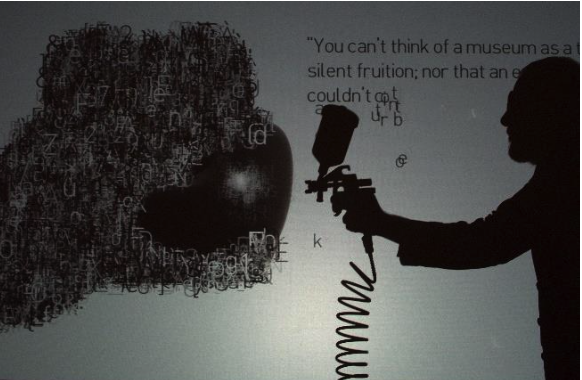 Interaction built on the dialogue between trivial, solid everyday objects and projected visual entities. To represent once more the dualism between utilitarian technology and visual research. 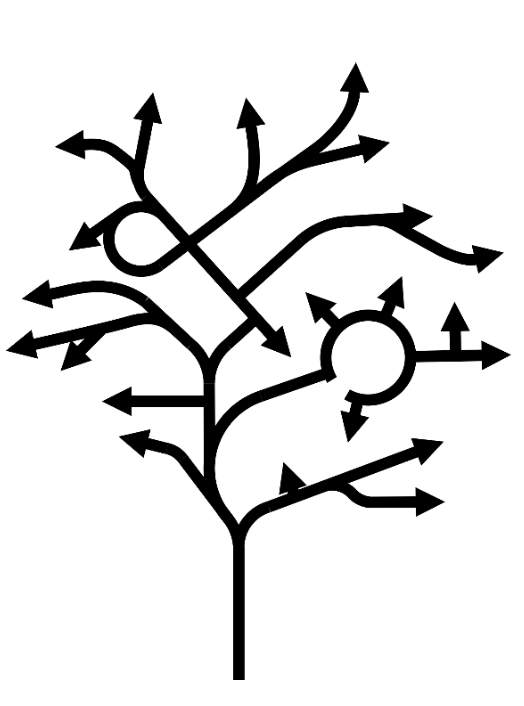 protoTree — This fits with the fascination I feel for the tree as a living being and as a computer data structure, for its abstract representations, graphic and functional. A bridge toward the coded language of road signs. 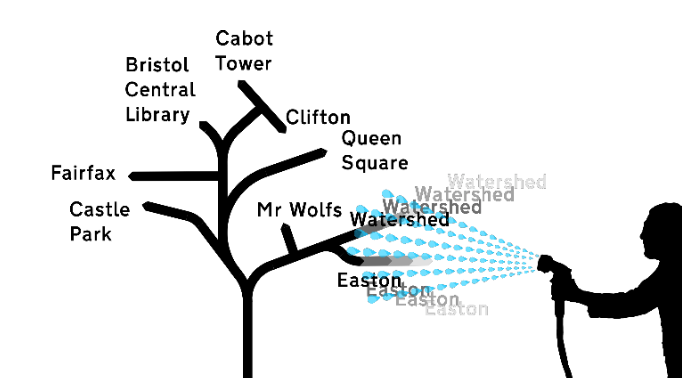 Junctions depicted as trees of directions, order and chaos. Even the arrows on a billboard sometimes seem spontaneously grown, not drawn. 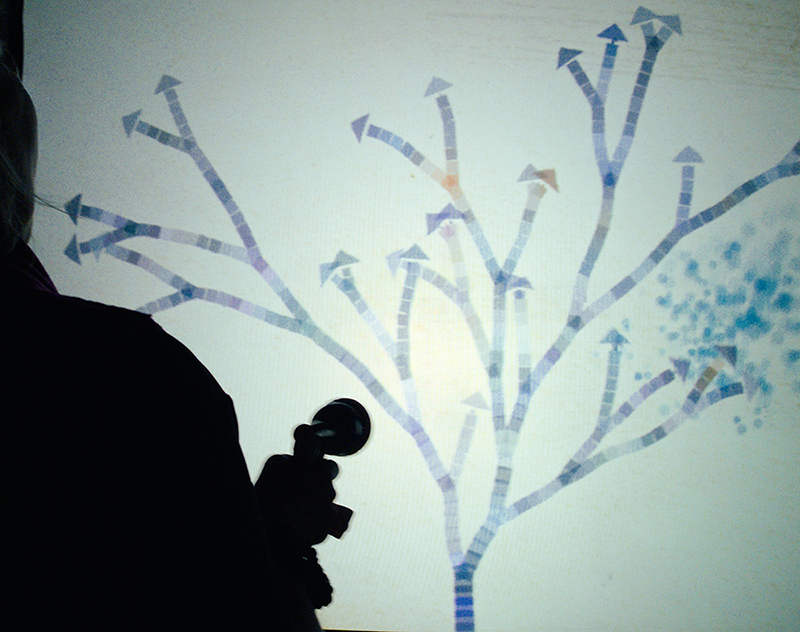 protoTree therefore is a tree that lives in a virtual space, a projection that depicts a canvas. 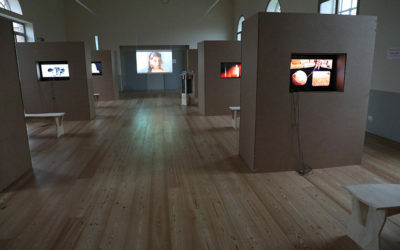 The viewer interactively stimulates growth. The graphical and geometrical tree’s structure is declared, the tiles that compose its body are imperfect geometric shapes, with traces of brush strokes or irregular runny color. The tiles overlap additively and reminds of water colors. 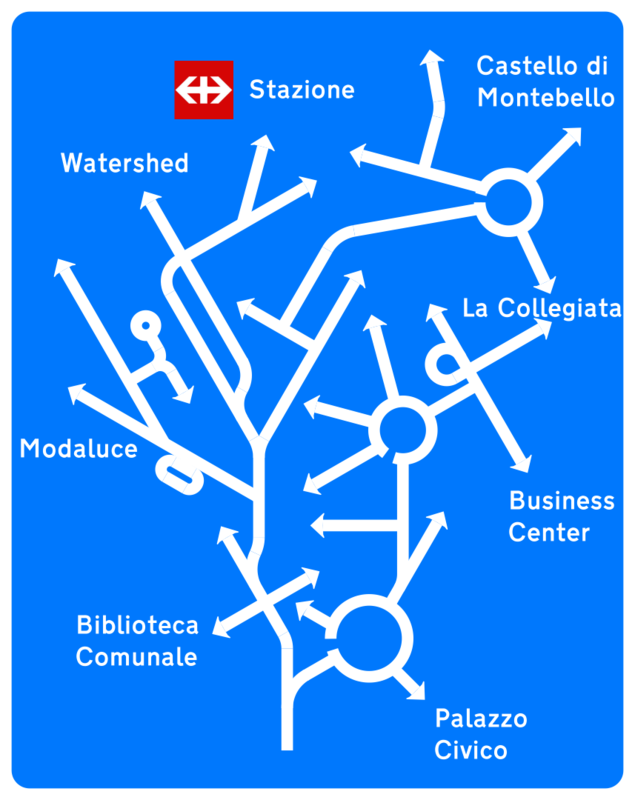 The branches end in arrows, reference to the dynamics of Klee and to the language of wayfinding. The growth algorithm is designed to underly the harmony between graphic and organic that I see in Klee. Graphic because the structure of growth is based on the addition of new discrete elements. Organic because the new elements, although discrete, are born and grow smoothly. In the growth of the tree the eye does not capture any solution of continuity. Tile colors are determined sampling digitized Klee works. The succession of colors in the sequence of the tiles is determined by a pseudorandom algorithm which explores the painting. At each fork the algorithm chooses a different direction along which gather colorimetric information. The visitor interacts by watering the tree, using a modified water hose gun. 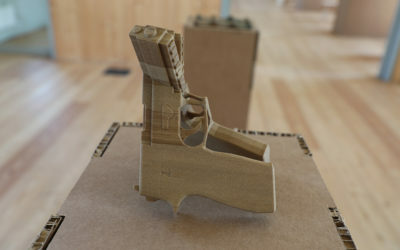 The interaction model and technology have been developed for the video installation protoTypo (2013), similar but based on the metaphor of the paintgun. Copyright © 2017 EX-NEW Contemporary Art Center all rights reserved | Designed By Pluton.